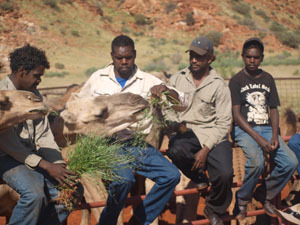 An inaugural week-long camel handling workshop has proven a huge boost to the locals of Walkabout Bore homelands and Tjitjikala community, south of Alice Springs. Fifteen people took part in the training initiative delivered by Charles Darwin University in conjunction with rural skills advisory body Rural Skills Australia. Central Australian camel identity Dennis Orr delivered the training at his homeland of Walkabout Bore. The five-day camel handling workshop started on April 6 and delivered best practice skills for the students to work with camels and counter their encroachment into remote communities. Occupational health and safety, animal welfare and stress management techniques such as working in a yard, handling, loading and unloading the camels were taught. CDU Rural Lecturer Peter Dempster said the pilot workshop focussed on the needs of communities. “Some communities have a camel problem and these skills address that,” he said. Local Gaven Campbell said he enjoyed the week. “When we got here it was scary, but after a few days we had them worked out,” he said. The care and welfare of both animals and handlers was central to the course. Consultation with bush community leaders and industry experts helped CDU to develop the course that empowered the community members to better understand and handle the animals. Trainer Dennis Orr said the group responded well to the course. “They showed a real flair and developed confidence quickly when working with the animals and I would be happy to have these sort of guys to work with me in the future,” he said. The project was funded under the Australian Government’s Industry Training Strategies Program, administered by the Department of Education, Employment and Workplace Relations.